Kailua – Barack Obama has taken winter vacations in 2008 & 2009 in Kailua and in the rented, ocean-front house Plantation Estate in the Paradise Point Estates in 2010, 2011 & 2012. The house was built by developer Harold Kainalu Long Castle, who also lived there. Obama also took a vacation break in August 2008 at a different Kailua house, Oahu Lani, during the 2008 U.S. presidential campaign. Kailua is 10.6 square miles. 7.8 square miles of it is land, and 2.8 square miles of it (26.62%) is water. A significant portion of this water area is Kawai Nui Marsh, the largest wetland in the Hawaiian Islands. 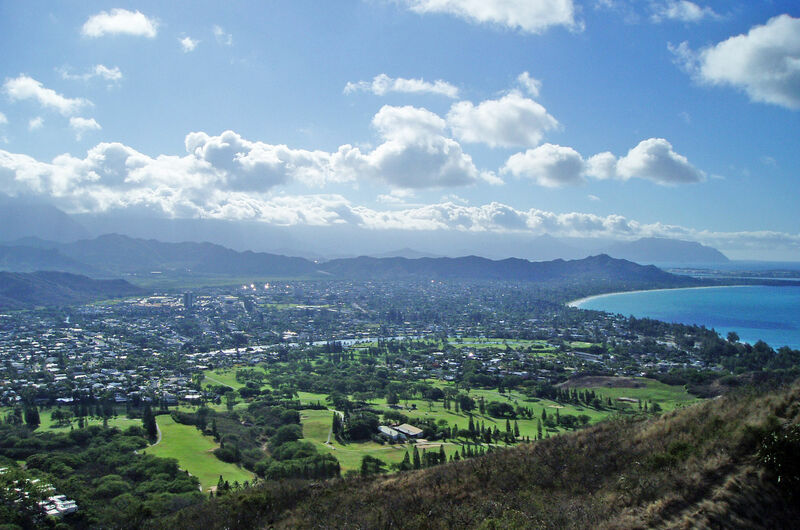 It lies in the Koʻolaupoko District of the island of Oʻahu on the windward coast at Kailua Bay. It is in the ahupua’a named Ko’olaupoko below the Nu‘uanu Pali. The population was 38,635 at the 2010 census and since than has grown quite a bit. Places of note in Kailua include Kailua Beach Park, Lanikai Beach, Kawai Nui Marsh, Maunawili Falls, and the Marine Corps Base Hawaii. Kailua Beach is crescent-shaped, about 2.5 miles long, and ranging between 50 and 150 wide. The ocean bottom fronting the beach slopes gently to overhead depths without any coral heads. Light to medium waves support surfing and bodysurfing. The steady trade winds make Kailua Beach a top windsurfing and kitesurfing destination. Robby Naish, first World Champion of windsurfing and Professional Windsurfers Association Hall of Fame inductee, grew up in Kailua. Sea kayaking and stand-up paddleboarding to the protected seabird sanctuaries Flat Island and the Mokulua Islands, popularly known as “the Mokes”, have become increasingly popular water activities at the beach. The arrival of Obama as well as various social media and travel sites have contributed to Kailua becoming overrun by tourists looking to get out of Waikiki. Kailua, once known as a sleepy beach town, became a hot tourist attraction overnight. Local residents, known for being very vocal, have been at war with legislators and developers, protesting various issues such as the arrival of Target, tour buses, and illegal vacation rentals that have opened due to the lack of appropriate legal accommodations. Crime, traffic and beach parking issues have been increasing since 2014. The Kailua neighborhood board asked the Hawaii Visitors Convention Bureau to stop promoting Kailua which led to various articles implying that “Tourists are not welcome”. The Hawaii Department of Education operates Elementary schools include Aikahi, Enchanted Lake, Kaelepulu, Kailua, Kainalu, Keolu, Lanikai, Maunawili, and Mokapu. Kailua Intermediate School, Kalaheo High School, and Kailua High School. CLICK HERE to see Homes for sale in Kailua!